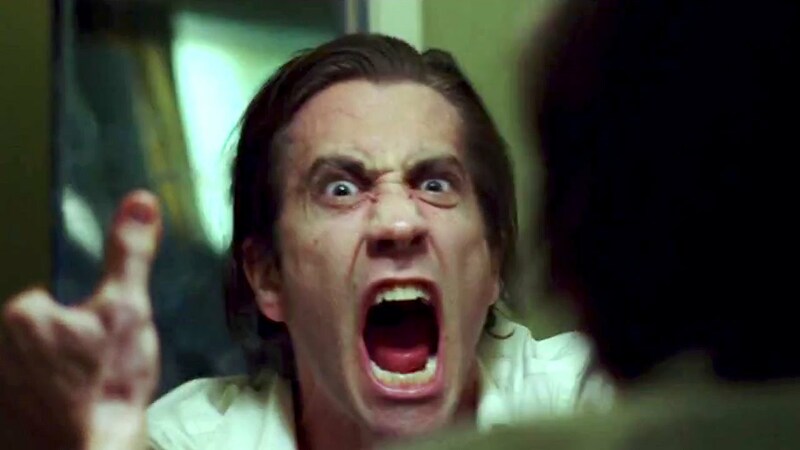 Taking on a character who, in many ways, is a contemporary incarnate of Travis Bickle, Jake Gyllenhaal gives a bravura performance as bug-eyed, amoral news cameraman Lou Bloom in Nightcrawler. A misanthropic sociopath, Bloom has trouble relating to other people and, like Bickle, he engages in extreme behaviours to impress a woman. This debut directorial effort from Dan Gilroy plays out as a satirical examination of the voyeuristic and increasingly invasive nature of television news in an effort to sate our seemingly endless desire to bask in the miseries of others. 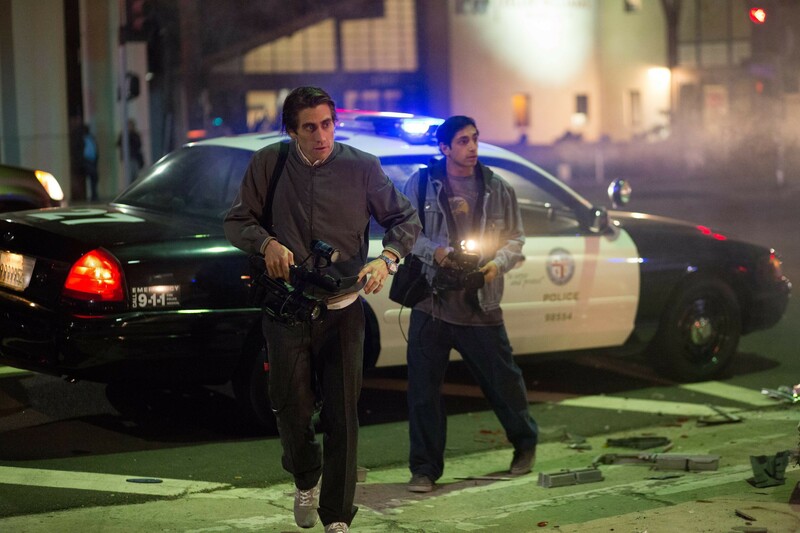 Scary for what it tells us about the nature of western society more so than anything that bloom shoots as he trawls the streets of Los Angeles, Nightcrawler raises all sorts of moral and ethical questions about the role and responsibilities of the media and our ever increasing appetite for the gory and the grotesque. There is little doubt that the movie will divide audiences with regard to both Bloom as a character and the broader issue that he represents. After all, Bloom is that part in all of us that slows down to gawk anytime we come across a car accident or other such scene of chaos, death and destruction. However, there are many who refuse to acknowledge that such an aspect of human nature exists within them and it is such people who will no doubt decry Bloom’s behaviour as abhorrent and indefensible, all the while tuning into Sunrise or the myriad other morning television news programs which facilitate the real-life media scavengers of the world. When we first meet Bloom, he exists on the margins as a thief and con-man with a confidence that belies his place in the world, much of which seems to be derived from self-help manuals rather than any achievement of any kind. When he stumbles upon an accident scene, Bloom senses an opportunity when he overhears a cameraman negotiating with a news outlet for the purchase of the footage. Our intrepid protagonist procures himself a video camera and soon finds himself in demand by news producer Nina Romina (Rene Russo), whose job is on the line if she can’t boost flagging ratings. However, as the pressure mounts on Bloom to produce increasingly salacious material, he takes matters into his own hands, one-upping his rivals and the police along the way. Bloom is seemingly devoid of any moral qualms about his actions and ultimately proves that he will go to any extremes to stay ahead in the game, sacrificing anybody who gets in his way. Despite being presented, in no uncertain terms, as the villain of the piece, there is no doubt that Bloom is by and large simply a product of demand. If there was no market for the type of footage he procures, there would be no need for him to trawl the streets preying on people at their most vulnerable moments. The fact is that television audiences lap this stuff up with abandon and it is in fact Nina, and others like her, who should perhaps be the target of our derision more so than Bloom. Given her willingness to go bloodier and more invasive than any of her rivals in a desperate bid for ratings, it is Nina who (literally) accedes to Bloom’s every desire and pushes him to go beyond what any reasonable person might consider acceptable. 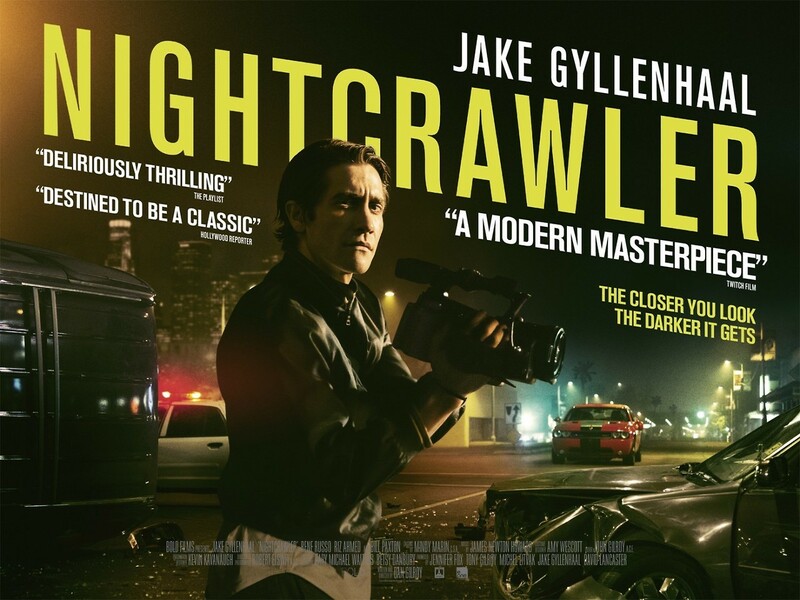 Despite the distinct unlikeability of the characters, Nightcrawler is a mesmerising, thought provoking piece of cinema that explores a particularly seedy, and ever growing, aspect of the media industry. Gyllenhaal is fabulous as Bloom, presenting him as a manipulative, creepy and ultimately quite pathetic character who stumbles into a career that is ideally suited to his personality. The physical transformation is palpable without reaching the extremes of, say, Christian Bale in The Machinist, and this might just be his best performance yet. While Bill Paxton is fun as Bloom’s arch rival, the character of Rick (Riz Ahmed), a homeless guy recruited as Bloom’s assistant, is very hard to grasp. He allows himself to be bullied and exploited by Bloom and it is difficult to know whether he is simply naïve, too frightened or just too dumb to do anything about it. Set almost exclusively at night, Nightcrawler presents a very different vision of Los Angeles and Gilroy, who also wrote the screenplay and is the younger brother of Tony Gilroy (Michael Clayton, The Bourne Legacy), has produced a wonderfully warped look at the underbelly of the news media that, given the appearances of so many real-life news presenters as themselves, might be much closer to reality than we would like it to be.